Patterns from one of the most flamboyant of artistic periods, including outlines of a lovely winged damsel, florals and vines, a vase, a butterfly, and much more. 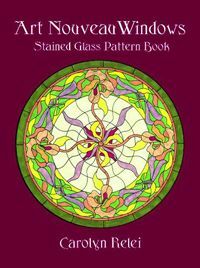 Includes: Over 100 authentic, royalty-free patterns. All displayed in rectangular, oval, circular, and semi-circular frames for use by craftspeople and stained glass workers at all levels of expertise.